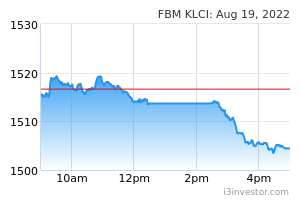 Despite lingering in the positive territory for most of the trading session, the eleventh hour profit taking sent the FBM KLCI lower to around the 1,854.44 pts yesterday. The MACD Histogram has extended another green bar, but the RSI remains below 50. Resistance will be pegged around the 1,880-1,890 levels. Support will be set around the 1,830 level. 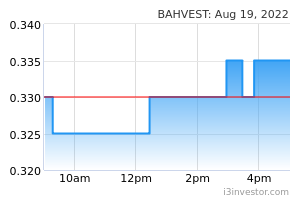 BAHVEST has extended its gains above the EMA20 level with high volumes. The MACD Indicator has issued a BUY Signal, while the RSI has risen above 50. Monitor for a consolidation breakout above RM1.23, targeting the RM1.45 and RM1.60 levels. Support will be set around the RM1.10 level. 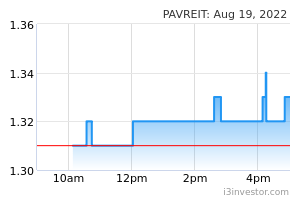 PAVREIT has rebounded to close above the EMA9 level with some improved volumes. The MACD Histogram has turned green, while the RSI has risen above 50. Monitor for a consolidation breakout above RM1.50, targeting the RM1.59-RM1.65 levels. Support will be anchored around the RM1.42 level. 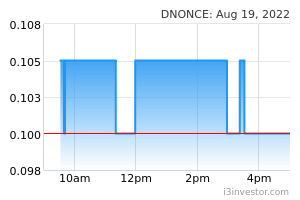 DNONCE has experienced a breakout above the RM0.335 level with high volumes. The MACD Indicator has issued a BUY Signal, while the RSI has risen above 50. Price may trend higher, targeting the RM0.365-RM0.39 levels. Support will be pegged around the RM0.31 level.